Formerly a small fishing village, Hurghada in the past years turned to one of the most important touristic spots of the Red Sea. Beside the favourable climate (360 sunny days per year and no atmospheric humidity) also the numerous water sport activities attract more and more tourists. Depending on the season there are various inexpensive flights or holiday packages offered by several tour operators. 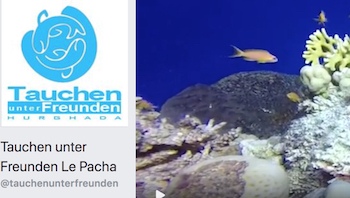 The Le Pacha Resort can be booked with some European Travel Agencies, from all the other hotels inside Hurghada the Tauchen unter Freunden Diving Center offers a transfer service free of charge. Records of vaccinations are not requested. Meanwhile the provision of drugs in Egypt is quiet good, nearly all medicine is available in the pharmacies. In Hurghada in the meantime several hospitals with a good standard are existing. Doctor’s bills and hospital charges have to be paid on site. For the treatment of diving accidents a new, ultra-modern Decompression Chamber is open now in Hurghada. The doctors of “Hypermed” ensure a 24-hour care for their patients. In the Diving Center we accept €, $, ₤, SFR, LE, Traveller Cheques, Credit Cards (Visa und Master). The national language is Arabic, but because nearly every Egyptian is a „linguistic genius“, English, German or French is understood in most cases.